This Japanese-style glaze also works brilliantly with tofu. 1 Put 2 tbsp vinegar, the mirin and 2 tbsp miso in a small pan over a low heat and whisk until the miso has dissolved. Turn the heat up and add the sugar, whisking constantly, until dissolved. Allow to cool a little. 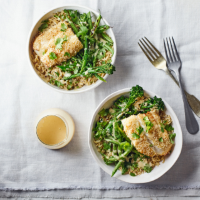 Put the cod in a non-metallic bowl and coat in the miso glaze. Cover and refrigerate for 20-30 minutes. 2 Preheat the oven to 220°C, gas mark 7. Put the sesame seeds on a plate. Take the sh out of the marinade and roll in the seeds to coat. Put on a baking tray; bake for 15 minutes until the sh akes. Meanwhile, heat a frying pan until smoking. Add the broccoli for 2-3 minutes, turning with tongs halfway. Put on a warm plate; repeat with the beans. Heat the grains according to pack instructions. 3 Whisk together the remaining 2 tbsp miso and 1⁄2 tbsp vinegar, the tahini, honey, garlic and 2 tbsp water; set aside. Put the grains into 4 bowls, add the vegetables and most of the coriander. Drizzle over the dressing; top with the cod and the remaining coriander.